PAD REVIEW: New Laurier Super Slimguard – Is it actually better? 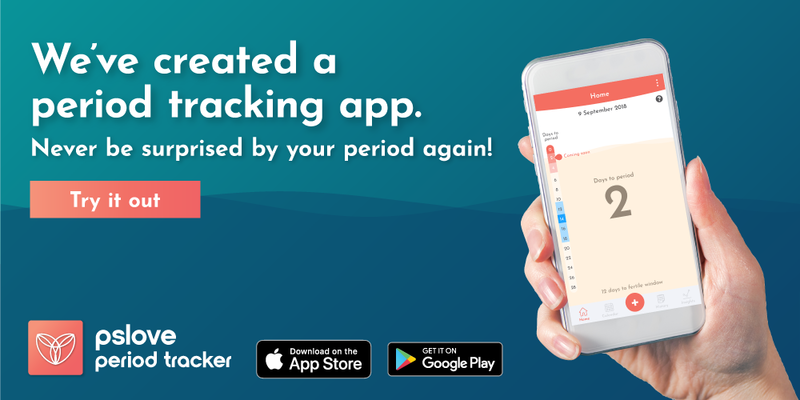 There’re always new and improved sanitary pads to write about every month! This month it’s no different; we’ll be reviewing the new Laurier Super Slimguard, a super popular choice among ladies in Singapore. The new version boasts a “speedy absorption and ultra dryness”. Let’s put the Super Slimguard to the test and see if it’s true! How is the new Laurier Super Slimguard different from the previous version? Initially, I thought that the pad wrapper became green, as there’s a transparent window which allows you to see the individually wrapped pads. However upon “unboxing”, I realised that the transparent window was just tinted. The wrapper is still white, like before. I must say that the outer packaging has a clearer description compared to the previous version! There were also *some* changes in the sanitary pad design, although I can’t really tell with my naked eyes. The most visible change is the colour of the pad. The texture felt the same, so I wasn’t sure if there was going to be any improvements in absorption, although I must say that I prefer the all-white to hospital green. It looks more clean and pure, don’t you think? “1mm ultra absorbent sheet”, “200x ultra absorbent”, “ultimate protection & comfort in 1mm” and “speedy absorption, ultra dryness” – these are all found on the packaging of the new Laurier Super Slimguard. It’s pretty obvious what Kao wants you to see! We shall further elaborate on this in the next section. *Warning: We used fake blood in this clip so watch at your own discretion! 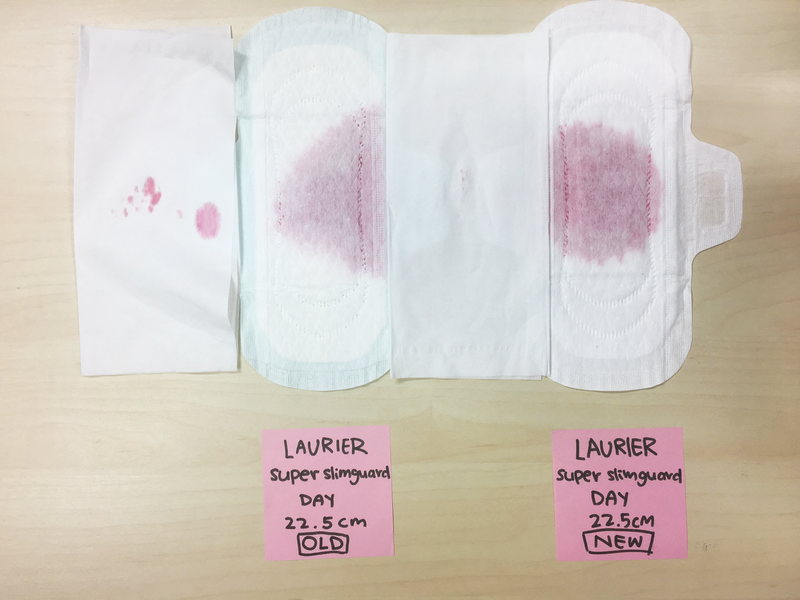 In terms of absorbency, whoa, the new Laurier SSG definitely surpassed that of the old. Just look at the clip above! The fake blood seeped into the new Super Slimguard so quickly compared to the previous version. I must say that the absorbency of this one exceeded my expectations. On to leakage protection! 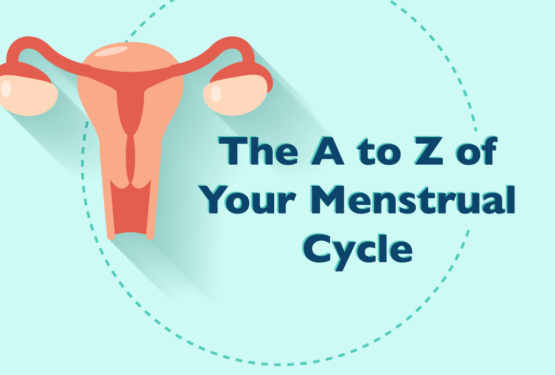 This aspect of sanitary pads is the most important for an ease of mind. 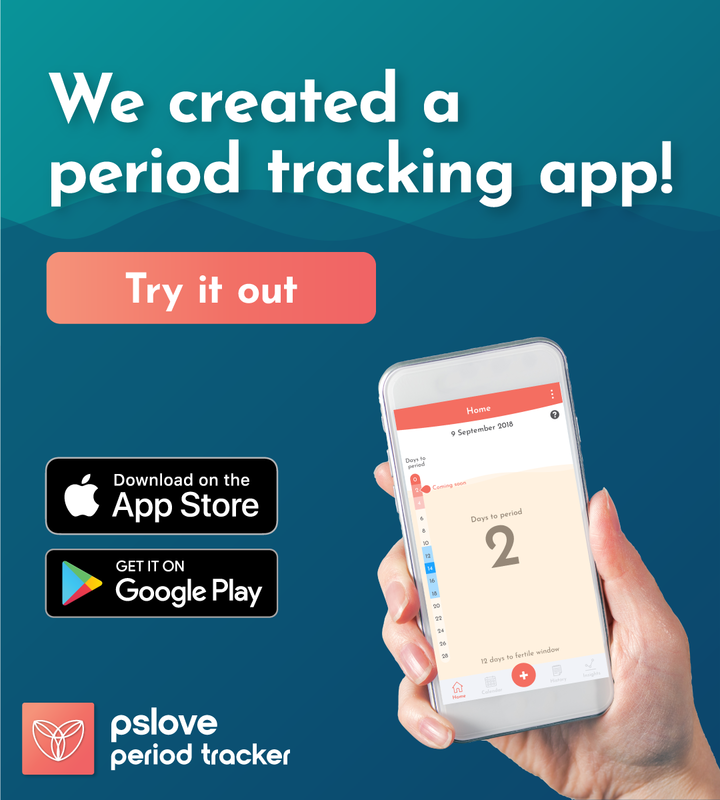 For us ladies, life goes on even when we’re on our period, and we don’t have time to worry about period blood leaking out and revealing itself. We need to use pads that we can trust. 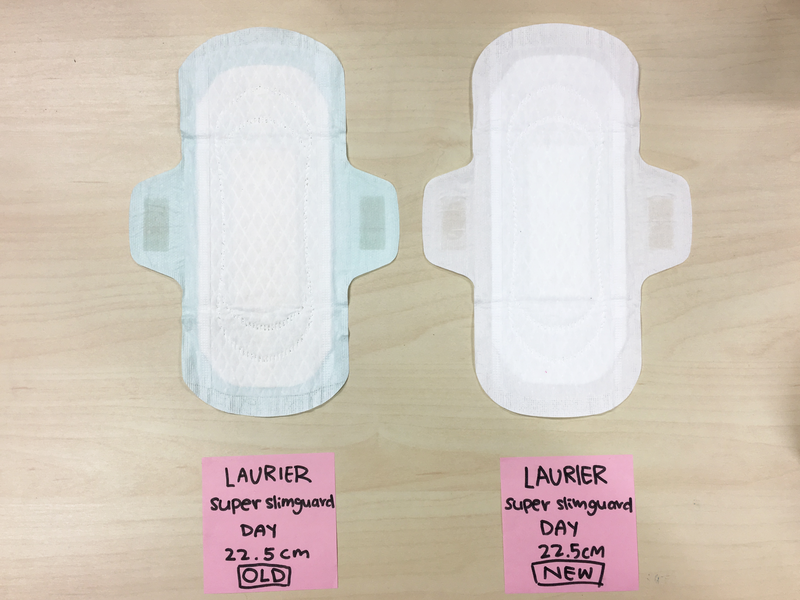 Upon tilting the sanitary pads, the new Laurier Super Slimguard won again, of course. Did you notice how the blood flowed downwards quickly and pooled at the bottom on the old Laurier Super Slimguard? I would have been so worried if I wore that on my period! Granted, this is the 22.5cm so it’s not meant for heavy flows. In terms of comfort, I would say it’s alright. It doesn’t feel plasticky and it doesn’t cause the area to be too itchy. The material used for the Laurier Super Slimguard is a cross between dry net and cotton, maybe more cotton. I don’t think that there was a change in the material used when I compared both versions. Should I try the new Laurier Super Slimguard? 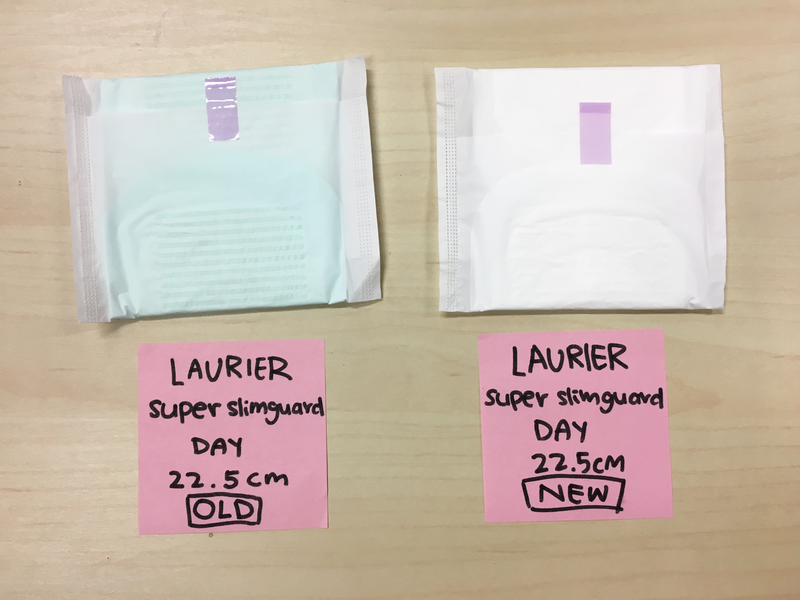 From past experiences with sanitary pad testing, I have to say that the Laurier Super Slimguard doesn’t disappoint in terms of both absorbency and leakage protection. It’s one of the better pads out there and I would totally wear this on my period, but I would get a longer version. That being said, everyone has their preferred pad brand and this is purely my own opinion. 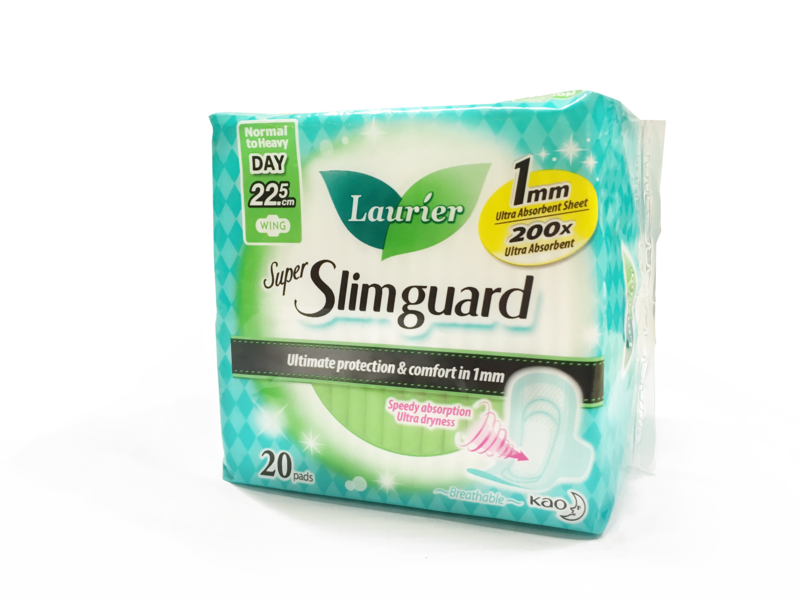 The only thing that would prevent me from wearing the Laurier Super Slimguard on a monthly basis is its price. Right now it’s retailing at S$6.45 at NTUC Fairprice, considerably more expensive than the one I’m currently using. Help us with a survey on lifestyle of working women and stand a chance to win a Starbucks card! *Only open to residents of Singapore.